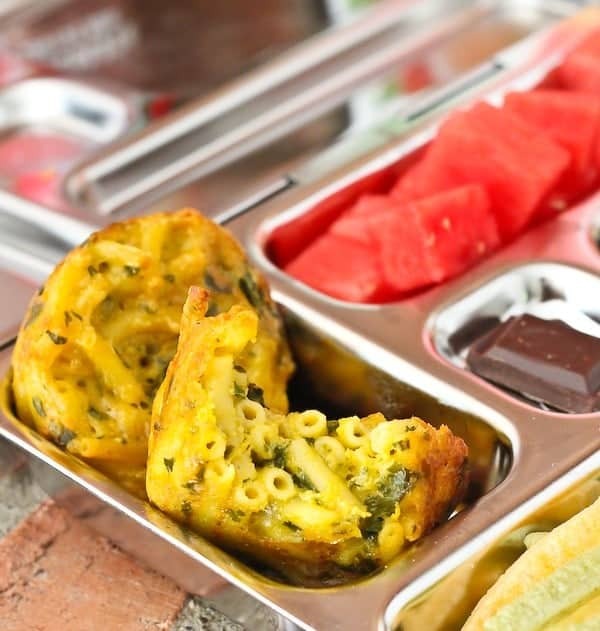 These spinach mac and cheese muffins are perfect for lunch boxes (they even taste great cold!). And psst — adults love ’em too! As a major type-A person, it’s never too early to start planning. 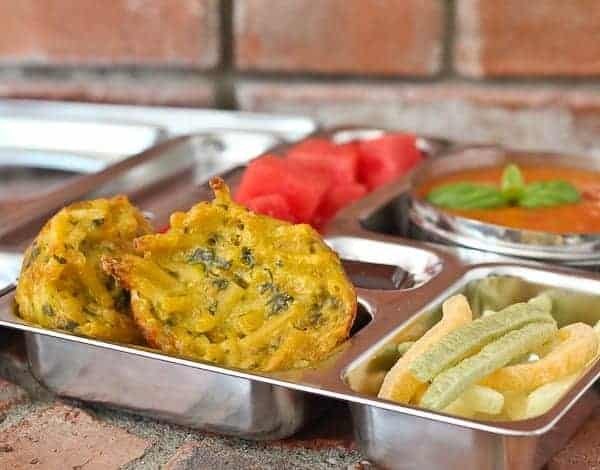 Although E won’t be eating lunch at school and N doesn’t go to school yet, quick and nutritious meals are still very important. We return home from picking up E from school right around lunch time so it’s great to have an idea of something to eat. Bonus points if it’s already made. I oftentimes find inspiration in the aisles of the grocery store. It would probably cut down my grocery bills if I would do a little more meal planning in advance and a little less on the fly….but I love just wandering the aisles and getting inspired by different products. 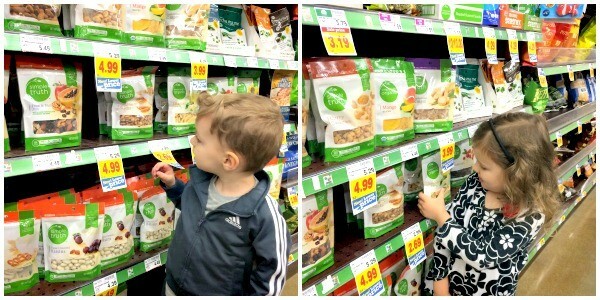 One of the departments I love is the Natural Foods Department at Kroger. 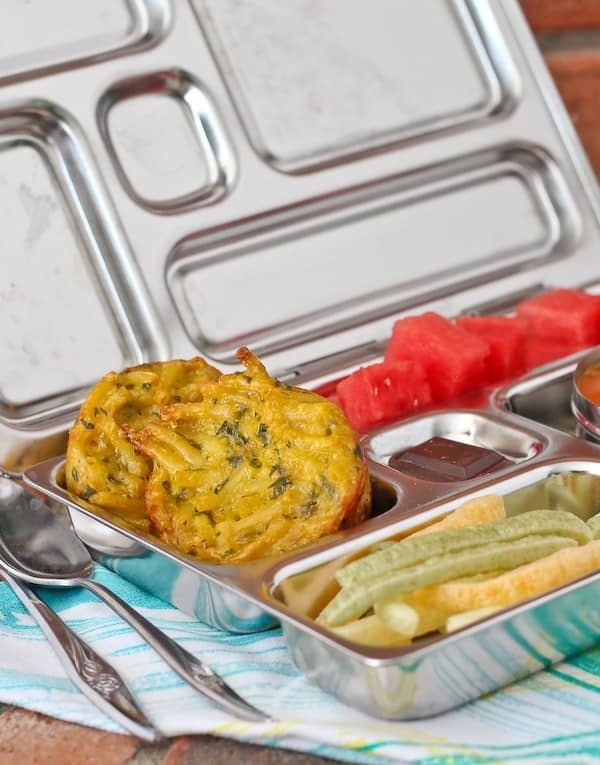 I’ve teamed up with them to bring you a fun and super easy lunch idea. 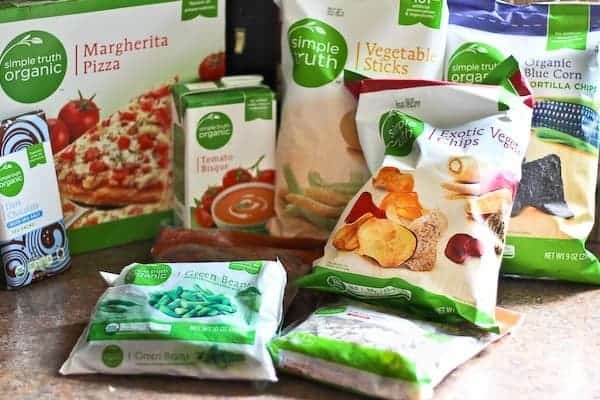 The kids and I had fun browsing the natural foods at Kroger – they immediately recognize Horizon Organic products and Simply Truth Natural Vegetable Sticks. 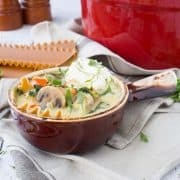 I grabbed some Horizon ClassicMac™ for this recipe as well as some Simply Truth Tomato Bisque…okay and I grabbed a few other things (I lack self-control, clearly). This fun meal is great for the kids but I also know of a grown man and one of his friends that loved this meal too. I mean, let’s be honest with ourselves, we’re talking about mac and cheese muffins – who wouldn’t love those? Paired with creamy tomato soup for dipping, this is a lunch made in heaven if you ask me. 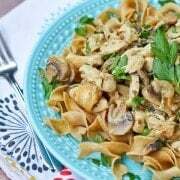 The whole lunch is ridiculously easy to make (my favorite!) and can be made in advance. When you’re draining the macaroni, make sure to pour the hot water and noodles into the strainer and not onto your hand. Or you’ll be whining about a burn for an entire day like I was. I make these mistakes so you don’t have to. That’s my story and I’m sticking to it. The mac and cheese muffins pack a veggie punch with finely chopped spinach and I fancied the soup up with a can of tomatoes. Makes it last longer too! 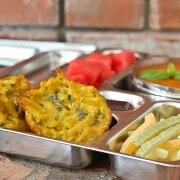 Overall this meal gives your kids (and you) a healthy dose of veggies. And then you’ll see I snuck a piece of chocolate there in the middle. Dark chocolate with sea salt – aka the way to my heart. Preheat oven to 350 degrees Fahrenheit. Spray 12 muffin tins with non-stick spray. Prepare macaroni and cheese as directed on box. 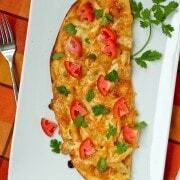 Once prepared, remove from heat and stir in spinach and grated cheddar cheese. Stir until combined and cheese is melted. Stir in beaten egg and continue to stir until combined. Spoon macaroni and cheese mixture evenly into prepared muffin tins. Place in preheated oven and bake for 25-30 minutes or until brown around the edges. Let cool at least 5 minutes before removing from muffin tins. While the macaroni and cheese muffins bake, heat soup and tomatoes in a medium sauce pan over medium heat until heated through. 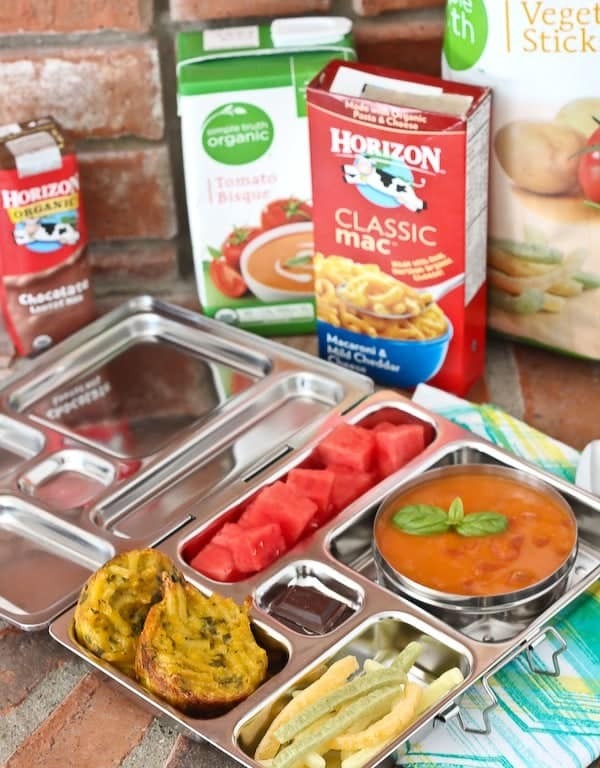 What are you planning for your kids lunch boxes this year? If you’re looking for inspiration, visit Kroger’s Inspired Gathering site for recipes, DIY + Décor, Tips + Tricks, and Cleaning hacks. I need to head over and check out those cleaning hacks! 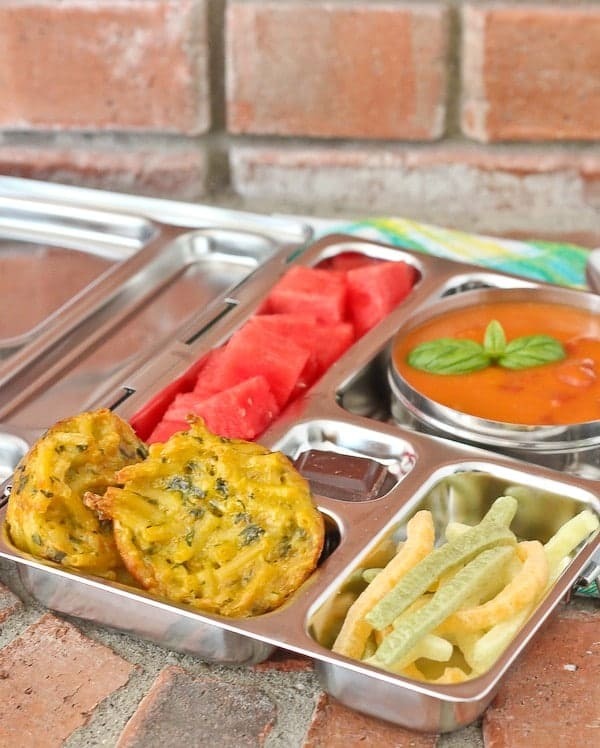 These are so perfect for back to school lunches… my kids would love them!